It was a fantastic start to the day with the G13 final! Malaysia’s Aifa Azman saw a two-game lead disappear and then came back from 6-10 down in the fifth, saving six match balls in all before taking the match 16-14 in the decider. 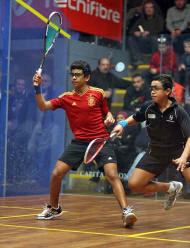 It was another five-setter that followed in the Boys U13, but this time the top seed triumphed as Mohamed El Shamy retained his title in similar dramatic fashion to how he won it last year. At 2-1 down and 9-5 down in the fourth it wasn’t looking good, as he took a second injury break of the game and looked to be struggling with leg and back problems. 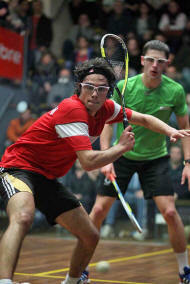 But he returned to take a rumbustious fourth game 12-10 – saving a match ball – and was in control in the decider. incredibly another five-setter ensued in the G15 final, this time a seesaw battle between the unflappable top seed Siv Subramanian, runner-up in last year’s final, and the excitable Egyptian Hania El Hammamy, still sporting her forehead bump from yesterday’s match. It swung one way then the other, with whoever got a lead in each of the games staying ahead until the end, and in the decider it was the Malaysians who were cheering the loudest. After saving a couple of game balls in a tight first, top seed Youssef Ibrahim always had the edge in his all-Egyptian B15 final with Moustafa Montaser. Next up it was another all-Egyptian final in the G17 climax, and once again it was the top seed who triumphed in straight games. 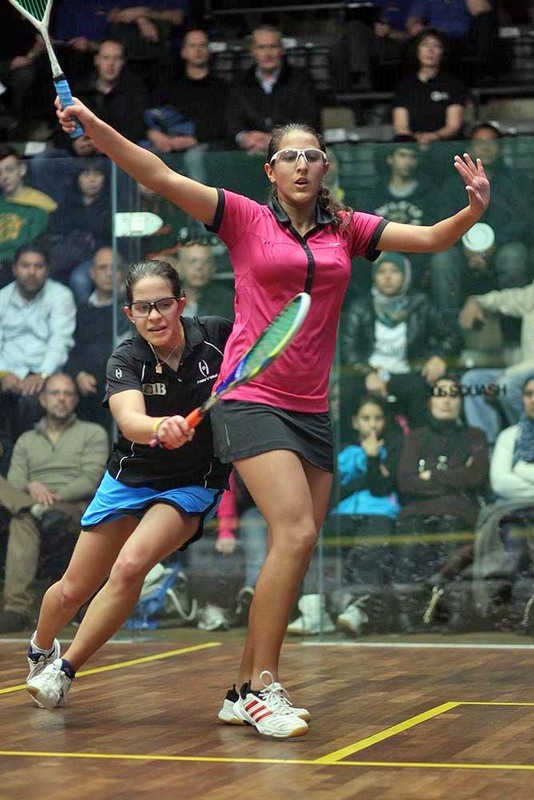 The irresistible force that is Habiba Mohamed was too strong for Hana Basem as she stormed through to collect her fourth BJO title in a row. 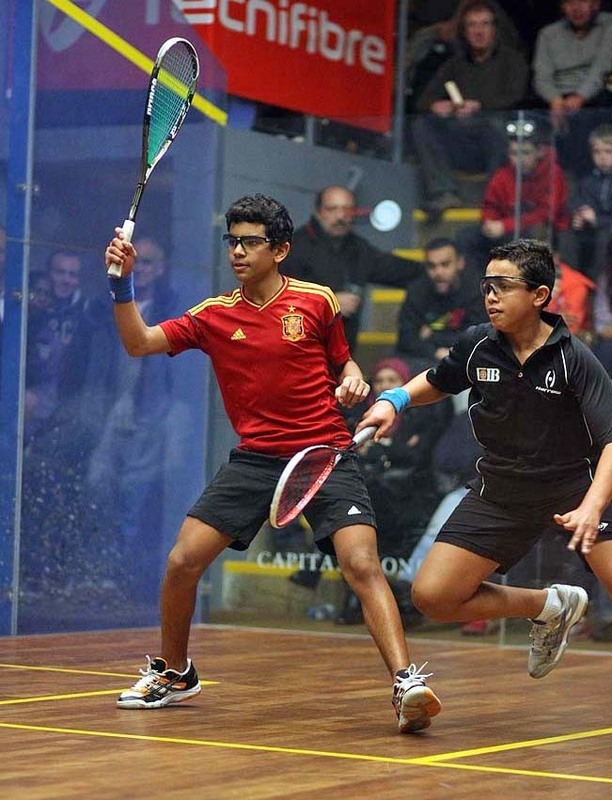 Egypt collected their fourth title when Boys U17 top seed Youssef Soliman beat Malaysia’s Ng Eain Yow – last year’s U15 winner – in four games. The Egyptian looked strong as he took a 10-5 lead in the first, and although Ng closed that gap and took a close second game, Suliman was on top again in the next two games to claim his first title. It was a repeat of their 2010 U15 final, but for Yathreb Adel the Girls U19 final was a sixth in a row, and she repeated her 2010 win over Mariam Metwally – the top seed – in four tough, uncompromising, tense, and fiercely contested games. Adel edged the first two after early deficits, but couldn’t do the same in the third as Metwally pulled one back. 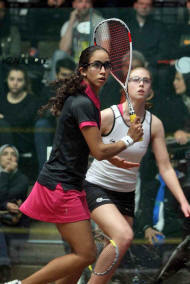 Adel was always just ahead in the fourth though, finally clinching her fifth BJO title in just unbder an hour. A new nationality was sure to be engraved on the Boys U19 trophy, the Drysdale Cup, as Peru’s Diego Elias, the U17 winner last year, took on Jordan’s Ahmad Alsaraj. Alsaraj forged ahead in the early stages of both the first two games and held on to those advantages, and although Elias rallied to take the third, it was the Jordanian who was on top from the start of the fourth, capitalising on a 7-1 advantage to take the game 11-3 and with it the title. While seven of the top seeds made it through to the finals of the Tecnifibre Junior Open in Sheffield, there were upsets aplenty in today’s semi-finals held at the Abbeydale and Hallamshire clubs. The Boys U19 title – the Drysdale Cup – will be won by someone other than an Egyptian for the first time since 2005, with Peru and Jordan claiming first-time finalists in two dramatic semis at Abbeydale. Diego Elias, who won the U17 title last year, beat top seed and world junior champion Karim El Hammamy in straight games to reach the final without dropping a single game. 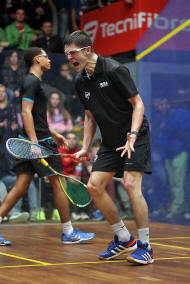 England’s George Parker came close to taking Amhad Alsaraj to a decider, but the Jordanian saved six game balls from 7-10 down in the fourth to clinch it 15-13 on his own first match ball. Despite their troubles in the B19 event, Egypt still have the chance to win seven of the eight titles, while Malaysia will be pleased with their haul of three finalists. Top seeds Siv Subramanian – who won 16-14 in the fifth on her sixth match ball after saving just one – and Ng Eain Yow are joined by Aifa Azman who beat the second seed in her G13 semi. While the Egyptian girls predictably dominated proceedings in the Girls U19 quarter-finals, the Egyptian boys are having a much harder time of it this year, and only one will feature in the Boys U19 semis. That one happens to be top seed and world junior champion Karim El Hammamy, but they’re use to having several chances at this stage, and all-Egyptian finals have been the norm in recent years. 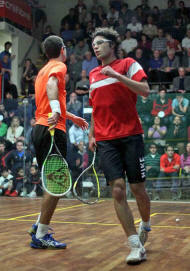 Hammamy meets last year’s U17 champion Diego Elias after the Peruvian maintained his unblemished record of 3-0 wins. 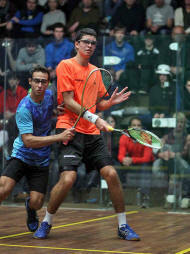 Ahmad Alsaraj of Jordan meets England’s George Parker in the other semi. Alsaraj came from a game down to beat unseeded Indian Kush Kumar, whose flamboyant shots weren’t quite enough on the night. Parker created a second successive big upset as he beat 3/4 seed and fellow Englishman Richie Fallows in a tempestuous all-English match. Parker surged ahead to take the first, held on in the second to double his advantage before Fallows struck back to take the third with something to spare. Parker went 9-4 up in the fourth, but Fallows fought back to 9-9 before Parker took it on his second match ball and claim an unexpected but thoroughly deserved semi final spot. Patrick Rooney made it two English representatives in the semis with a professional 3-0 display against national rival James Peach. Rooney now moves on to face No2 seed Ng Eain Yow of Malaysia. It was another busy day in Sheffield as many of the draws worked their way down to the quarter-final stage. At Abbeydale, where all the finals will be held, there were two rounds of play in the Boys U19 and one in the Girls top age group as the quarter-finalists were decided. Egypt predictably dominated the Girls event with their top four seeds all winning, but England will have three players in the quarters, Anna Kimberley, Nada El Kalaawy and Lily Taylor. There was less good news for Egypt in the boys matches with just two left in contention, while England are guaranteed a semi-finalist after wins from both Richie Fallows and George Parker. However the upset of the day though came from India’s Kush Kumar who took out second seed Shehab Essam in three impressive games. It was an earlier start than usual for some on the opening day of the Tecnifibre British Junior Open, being staged in Sheffield for the 19th year in a row, as Sheffield’s own world champion and world number one Nick Matthew hosted a book signing at the Copthorne Hotel, giving some lucky juniors a chance that most professional players can only dream about …having Nick Matthew for breakfast! Then the action took place at three venues – Abbeydale, Hallamshire and Fulwood – for a busy opening day featuring 400+ players and 36 nations. The large Egyptian contingent – in serious contention for a clean sweep of all eight titles – had a good day with their seeded players progressing in all divisions, but it was the Malaysians who had most to cheer about with an impressive 23 wins out of 23, the highlight being a comeback from 0-2 and 0-5 down from Kah Yan Ooi in the Girls’ U15 event. There were plenty of home players in action too, of course, with Richie Fallows and Lily Taylor – both featured on the tournament poster – leading the charge into day two. 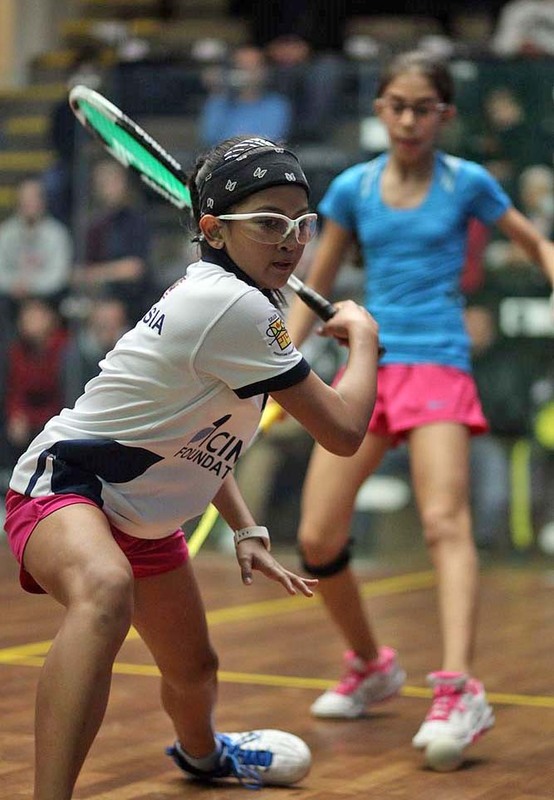 The Tecnifibre British Junior Open, the most prestigious junior squash event in the world returns to Sheffield for the 19th consecutive year. Tecnifibre, Official Partner of England Squash and Racketball are title sponsors for the event which will see 424 players from 36 nations compete between the 2nd – 6th January. Hallamshire Tennis & Squash Club and Abbeydale Park Rackets & Fitness Club remain as host venues and are joined once again by Fulwood Sports Club, enabling all 8 categories to be played out in full monrad. 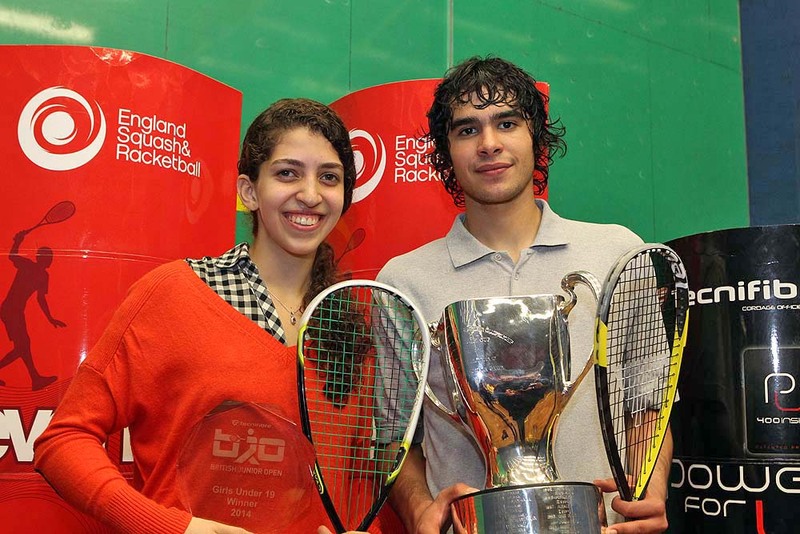 Egypt will return to Sheffield with some exceptionally strong players, taking 7 out of the 8 top seed positions. 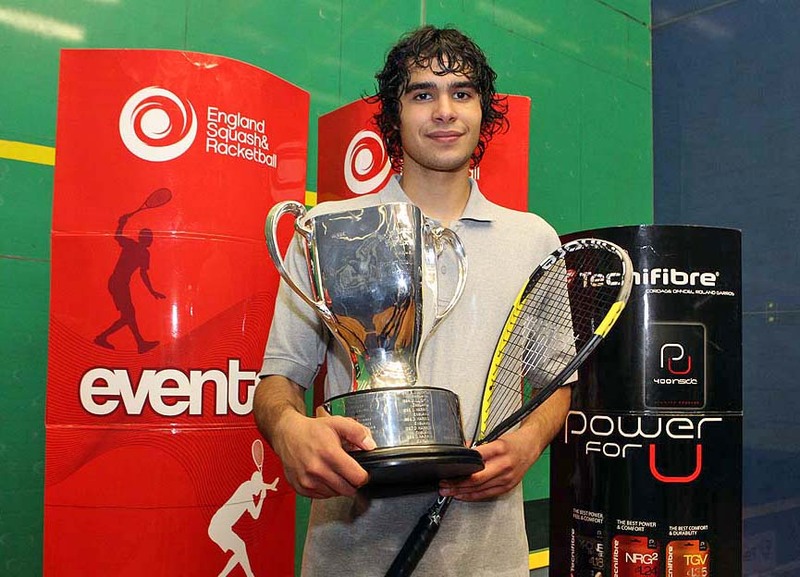 2013’s Junior World Champion Karim El Hammamy takes his place at the top of the Boys under 19 draw, with fellow countryman and two time British Junior Open Champion, Shehab Essam as the number 2 seed. Hoping to spoil it for the Egyptians is 3/4 seed and last years Boys Under 17 champion Diego Elias of Peru and England’s own Richie Fallows of Essex who occupies the other 3/4 seeded position. This years Girls under 19 competition looks to be an all Egyptian affair, as they occupy all of the top 4 seeded positions. 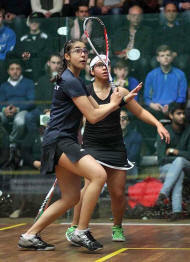 Top seed Mariam Metwaly who came runner up at the World Juniors this year is favourite for the title, however last years under 17 British Junior Open champion Yathreb Adel, will be looking to make it 3 in a row. 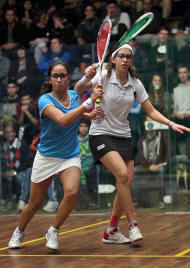 Last years runner up Nouran Gohar, and Salma Hany occupy the 3/4 positions. The Boys under 17 competition will be a battle between Egypt and Malaysia. Top seed Youseff Soliman (Egy) who finished runner up in 2012 in the under 15 category will be closely chased by the number 2 seed Eain Yow Ng (Mas) who won last years boys under 15 competition. The battle continues with Mohd Mukhtar (Mas) and Karim Ibrahim (Egy) taking the 3/4 positions. In the girls under 17 competition top seed Habiba Mohamed (Egy) will be looking to make this her 4th title in a row, but will face tough competition from her fellow Egyptians who take the rest of the top seed positions. The boys under 15 category looks to be fiercely contested with Egypt’s Youseff Ibrahim topping the seeds and team mate Ziad Sakr coming in at number 2. 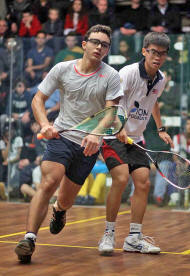 Marwan Tarek (Egy) and Moustafa Montaser (Egy) take the 3/4 spots. Malaysia’s Siv Subramaniam was last years Girls under 15 runner up , but takes the top spot this year, and is hoping to spoil the day for Egypt as they take the next 3 seeded positions with Rowan Reda at 2, and Amina Yousry and Hania El Hammamy at 3/4. 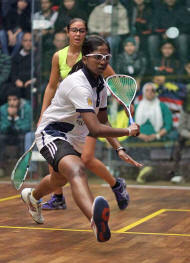 England’s hopes lie with Elise Lazarus (Essex) who holds a 5/8 position. Egypt look set to take both the Girls and Boys under 13 titles with Mohammed El Shamy at 1 and Asser Hisham at 2 in the boy’s competition, and Jana Shiha topping the girls draw and Nouran Youseff at number 2. Play starts every day at 9am with all finals scheduled to start from 9.30am on Monday 6th. All spectators are welcomed free of charge.